Alexander Henry Cobb was born on 7 April 1861 in Ipswich, the son of Printer and Publisher Henry Cobb (1833-1921) and Anna née Coates (1836-1921) both originally from Essex. In the 1861 census, taken the day after Alexander's birth, Henry and Anna were listed at 51 Berners Street, Ipswich, Suffolk where Henry gave his occupation as 'Editor & Publisher'. One-day old Alexander was as yet un-named. In the 1871 census Henry and Anna were living at 5 Trinity Street, Colchester, Essex, with their children; nine-year old Alexander, Fanny (b 1863) and Emma (b 1864) together with a general domestic servant. Henry gave his occupation as 'Printer & Publisher employing 6 men and 13 boys'. Alexander was listed as a scholar. 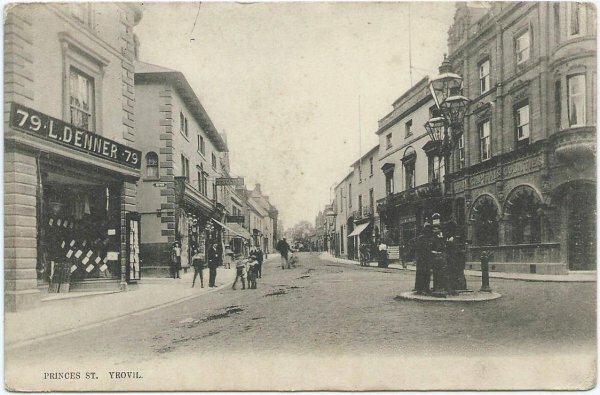 By 1881 the family had moved to Yeovil and Henry had set up his bookselling and printing business at 79 Hendford on the corner of Porter's Lane. The premises would later be acquired by Linsey Denner and, later still, would be demolished to widen Porter's Lane into today's Westminster Street. In the census Henry gave his occupation as 'Bookseller & Printer, employing 1 assistant, 1 man & 6 lads'. Alexander was listed as the Assistant Bookseller. In 1891 Henry Cobb founded the Yeovil High School for Girls in The Park, colloquially known as Yeovil High School, together with Colonel Marsh and others. His daughter Fanny became its first headmistress initially with just a dozen pupils. In 1901, at the age of 30, Alexander married Minnie Eliza Hull, the sister-in-law of prominent glove manufacturer Edward Samuel 'Sam' Ewens. They were to have three children; Charles Graham (b 1893), Arthur Henry Kingston (1896-1986) and Keith Loveland (1902-1982). In the 1901 census Alexander and Minnie, together with Charles and Arthur, were listed living at Newland Villa, Summerlands, Preston Road just a few doors along from Sam Ewens - a step up the social ladder following his becoming a glove manufacturer almost overnight! In 1898 Alexander went into partnership with his brother-in-law, Sam Ewens, even though Alexander knew nothing of the glove trade, having previously been a commercial traveller in the book trade. They formed the glove manufacturing company of Ewens & Cobb and it would appear that Sam provided some financial surety for Alexander "in order to give him a start". However the partners soon fell out and in 1902 Alexander took Sam to court - for full details see here. In brief, Alexander won the case and Sam was forced to sell his house 'Summerlands' which was just a few doors along from where Alexander now lived. According to Ted Ewens, Sam's great grandson "The family view was that Cobb was a rogue and that there was a miscarriage of justice." Following the court case and now that he had some capital and, presumably, some small amount of experience in the glove trade, it appears that Alexander next went into partnership with Russell Pittard, the son of leather dressing magnate Ebenezer Pittard, with Alexander the senior partner of Cobb & Pittard. Alas the partnership, and consequently the firm of Cobb & Pittard, lasted only until the following year when Cobb charged Pittard with theft and embezzlement. This time, however, due to Cobb's ineptitude in keeping the company accounts, the case was thrown out of court with "loud cheering in the Court and among the crowd outside" from Pittard's countless friends. For details of the case see here. It is not known when, but certainly after the court case (and probably not able to get out of Yeovil fast enough), he moved to 10 Croxted Road, West Dulwich, Surrey. He died on 29 July 1915 in, of all places, Calcutta, India. He was aged 54. Probate was granted to the Public Trustees on 18 January 1916 with his effects valued at £1,579 15s 10d (in excess of £600,000 at 2014s value). This postcard of Princes Street was taken in 1904. At left is Linsey Denner's "gentleman's and juvenile ready-made and outfitting establishment" at 79 Hendford, immediately next to the narrow entrance to Porter's Lane. Denner's shop had previously been the bookshop and printing works of Henry Cobb and was where Alexander worked in his youth.